Orthodontic headgear is a special appliance which may be recommended by your orthodontist, when braces alone aren’t enough to move teeth into a better position. It can also be used to correct trouble with the bite or remedy problems in the growth of the jaws. 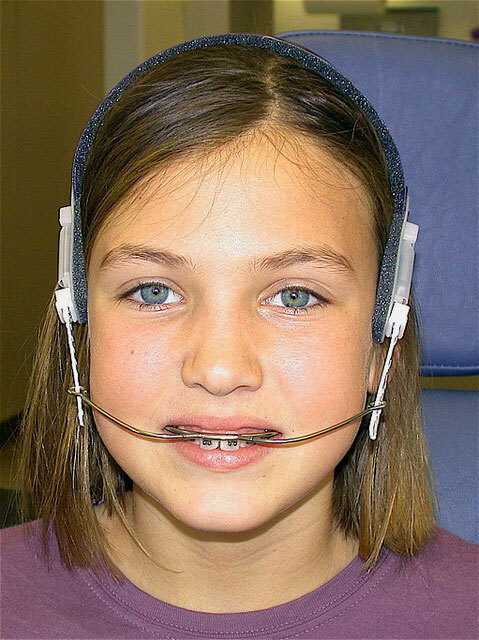 Headgear is used to create enough force to move the teeth properly as well as guide the growth of the face and jaws. The appliance usually consists of a strap that runs around the back of the head or neck and attaches to orthodontic brackets, mostly on molar teeth. As headgear worn partly outside the mouth, so usually patients doesn’t feel comfortable while using it but the good news is that you don’t have to wear headgear every time and also the discomfort generally goes away in a few days. Generally orthodontist recommend pain reliever like Ibuprofen and a soft diet, to help you adjust. There are several different types of headgear but for every type, there is only one instruction that you have to follow the instructions about wearing your headgear in order for it to be effective. You have to put it on each day for the time specified, i.e. If you are wearing your headgear at night, then you can’t miss one night and if you do so then you must make up the time the following day. It is important in order to retain what you have accomplished in the previous seven days of wear otherwise it could be wiped out. Following are some common types of headgear, designed for different individual needs. Cervical pull is one of the most common types of headgear. It consists of U- shaped wire and a strap. The wire attaches to the bands on back teeth, and strap is worn behind the neck of patient. In addition to cervical pull, there is another similar type called high-pull headgear. The only difference lies in the strap, unlike behind the neck in cervical pull, the strap goes behind and over the head. Cervical pull headgear is less visually as well as easy to wear. These headgears are designed to deal with the problem of excessive horizontal overbite, technically termed as overjet. Typical function of these two types of headgear is to hold back the growth of the upper jaw. Adults who are suffering from improper bite as a result of tooth extraction, can also used them in order to maintain a proper bite. Recommended wear time is from 12-14 hours each day. Also known as facemask headgear, is generally used to correct an underbite. It pulls the upper jaw forward in order to catch up with the lower jaw and help to make a proper bite. It consists of only two pads connected by a vertical frame. One pad rests on the forehead while the other on the chin. Elastics or wires, which connect from the frame to the braces, plays major role as they exert the pulling force. Recommended wear time for this appliance is from 14-16 hours daily. Like every other treatment and appliance, headgear has also some side effects. The most adverse side effect that can appear as a result of using headgear is to have a difficulty in breathing while sleeping for the rest of patient life. As headgear pulls the upper jaw backwards into the airway and the back wall of the upper jaw forms the front wall of the upper airway, so pulling backwards on the upper jaw has an impact on the upper airway and this is dangerous as the airway is too small for the tongue, which can block the airway during sleep. In addition to this, pulling the face backwards is another side effect of headgear, as forward grown faces are considered as more attractive. As a result, here have been many alternatives to headgear, which were designed to push the lower jaw forward, rather than pull the upper jaw backwards.Temporary side effects are also there such as difficulty while eating, sleeping, and performing head-and-neck motions. Patient can experience some soreness while chewing or a little looseness in the first molars but this is normal. In case of unusual pain, anchor band on your first molar to which headgear is attached become loose or headgear suddenly seems not to fit correctly, immediate consultancy is recommended. In case of overbite correction, it takes typically for 1 to 1.5 years depending on the severity of the overbite. Duration of treatment with headgear depends on other factors also like how much it is worn and how much a patient is growing.